Lenovo OneKey Recovery is software pre-loaded on Lenovo/idea laptops, designed to back up and restore your PC. To utilize the features of the OneKey Recovery system, your hard disk already currently includes a hidden partition from factory to store the system image file and the OneKey Recovery system program files. 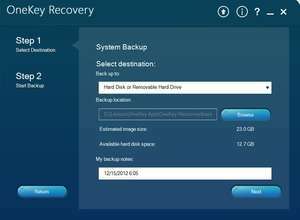 To utilize the features of the OneKey Recovery system, your hard disk already includes a hidden partition by default to store the system image file and the OneKey Recovery system program files. This default partition is hidden for security reasons, which explains why the available disk space is less than the stated capacity. Version 8.1.0.4501 is a freeware program which does not have restrictions and it's free so it doesn't cost anything. For security reasons, you should also check out the Lenovo OneKey Recovery download at LO4D.com which includes virus and malware tests. Additional screenshots of this application download may be available, too.